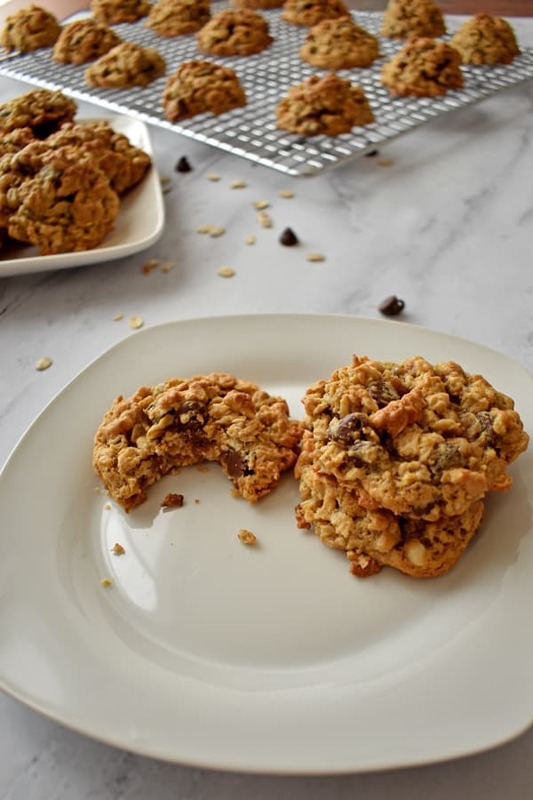 Gluten Free Oatmeal Cookies with chocolate chips and peanut butter are hard to resist. 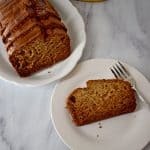 They’re crunchy on the outside, chewy in the middle, and have just the right amount of sweetness!! 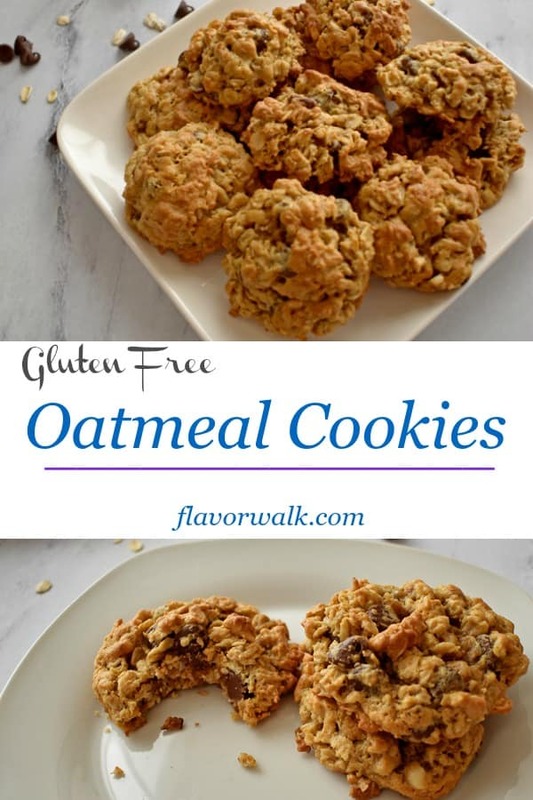 If you’re a fan of oatmeal, like I am, you’ll love these cookies. 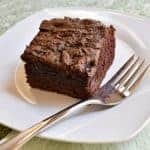 The addition of chocolate chips and peanut butter make it hard to eat just one, or two, or three. However, if oatmeal is not your thing, but you like chocolate and peanut butter check out my Chocolate Chip Peanut Butter Cookies and/or my Peanut Butter Chocolate Chip Cookies. 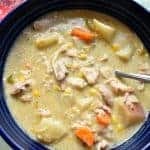 The ingredients are similar, but the flavors are totally different. Cookies are a treat we never outgrow. Whether served with coffee or tea, packed in a lunch box, or eaten with ice cream, most people won’t turn down a homemade cookie! If you’re familiar with the process for making a standard drop cookie, you’ll have no trouble with this recipe. 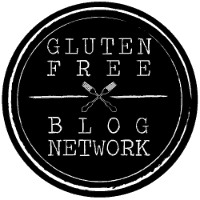 Gluten Free Oatmeal Cookies mix up quickly. 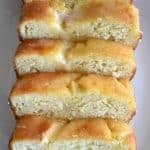 You can have the dough ready to put on the baking pans in 10 minutes or less. Start by creaming the butter and sugars together. Then blend in the eggs and vanilla and add the peanut butter and baking soda. 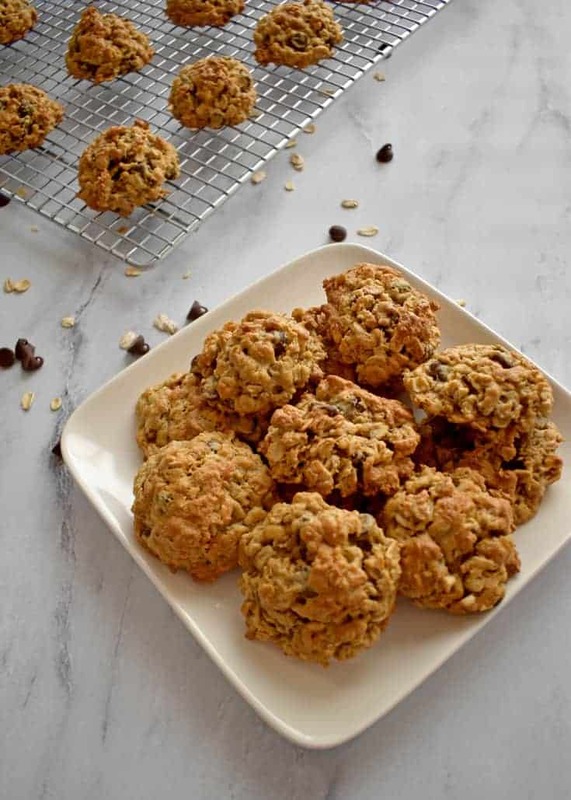 Stir in the oats and chocolate chips and you’re ready to get the dough on the prepared pans. Drop the dough by 2-tablespoon portions, about 2 inches apart, onto silicone lined baking pans. Bake the cookies in a 375-degree oven. 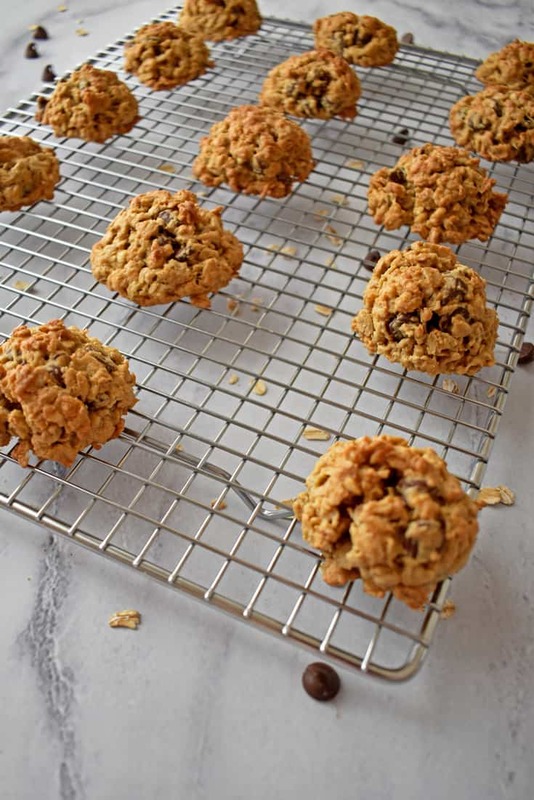 Ten minutes in the oven is all the time these oatmeal cookies need. 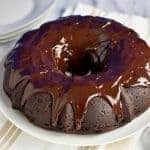 The cookies will be nicely browned on the top and your kitchen will be filled with a wonderful aroma. Once the cookies come out of the oven, remember to allow them to cool on a rack before serving. I recommend using a large mixing bowl (5-quart size) to handle the 6 cups of oats required. 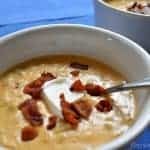 The large bowl makes it easier to mix everything together without spilling any of the ingredients. Silicone baking mats keep the cookies from sticking to the pan and make clean up a breeze. You can use parchment paper if you don’t have the silicone mats. In the long run the baking mats are less expensive than parchment because you can use them over and over again. I love my 2-tablespoon cookie scoop for drop cookies. 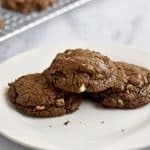 This scoop guarantees all the cookies are the same size and will bake evenly, and it speeds up the process of getting the dough onto the baking pans and in the oven! 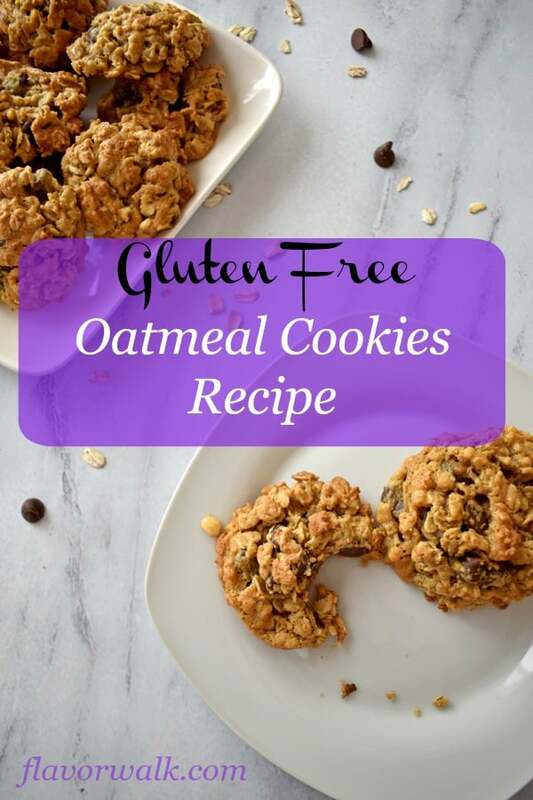 Any time is a great time for cookies, and Gluten Free Oatmeal Cookies are easy to make and a treat everyone will love. 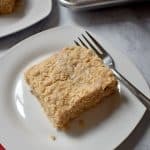 They’re the perfect combination of crunchy on the outside and chewy on the inside! 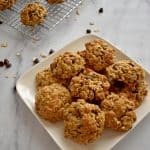 I’ve shared these oatmeal cookies with neighbors, family, friends and co-workers and every time I do, the cookies disappear quickly. 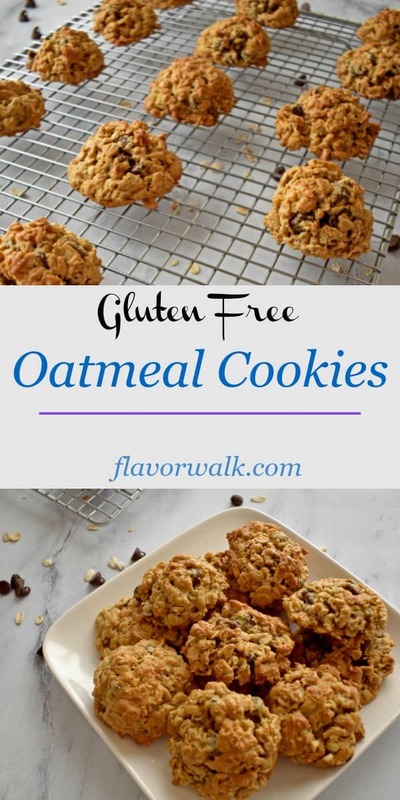 This Gluten Free Oatmeal Cookies Recipe makes a lot of cookies. The cookies freeze really well, but you can easily cut the recipe in half and still end up with 3 dozen cookies. 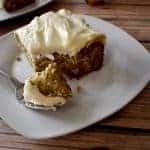 When you make this recipe, I’d love to hear what you think. Enjoy! 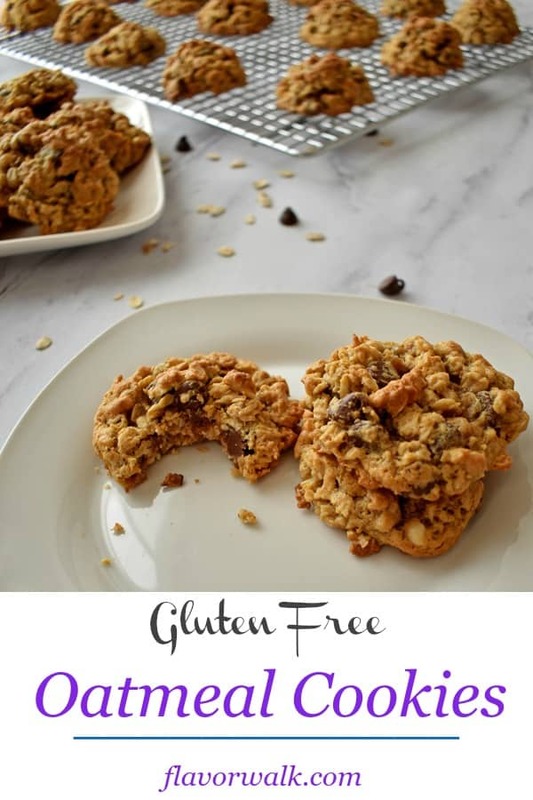 Gluten Free Oatmeal Cookies with chocolate chips and peanut butter are hard to resist. 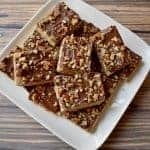 They're crunchy on the outside, chewy in the middle, and have just the right amount of sweetness!! Preheat oven to 375 degrees and line baking pans with silicone liners or parchment paper. Add in the eggs and vanilla and stir until combined. Stir in the peanut butter and baking soda. Add the gluten free oats and chocolate chips and stir until all the ingredients are thoroughly combined. Using a 2-tablespoon cookie scoop, drop the dough onto the lined baking pans about 2 inches apart. Bake for 8 - 10 minutes until the tops of the cookies are brown. These were really good cookies. I will make then again.